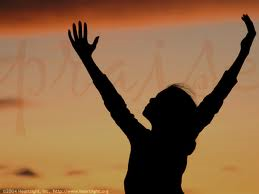 His praise shall continually be in my mouth,” reads Psalm 34:1 (NKJV). Lord, today I choose to ‘bless’ your name – to praise you for all that you are. I often forget you, and complaints slip out more easily than praise. But I choose to find a way. A way back to the practice of gratitude. Help me to focus on you as the source of all joy, and remember the amazing things you’ve done. And let us exalt His name together,” the Psalm continues. Praise is even better in groups, Lord. Help me to talk about you with others, and lift your name high with people who love you like I do. We have so much to be thankful for, together. So often I have come to you, trembling, afraid of the future. Thank you for always listening. Thank you that I’m not ruled by fear and anxiety anymore but can live in your perfect peace, and the security of your strong, loving arms. The more we look upon you – your words, your life, yourself – the more radiant and confident we will be. No one but Jesus can offer us freedom from shame, and guilt, and condemnation. Lord, may your glory and your majesty shine brightly through us. Next Are you an introvert or an extravert? Thank you for that Ali. I loved the last verse you shared. I don’t have to walk in shame!!! I’m glad Rolain! Yes, we can walk forward freely and confidently because of Jesus. Shame turns to radiance when He does His work in us. Freedom from shame is exhilarating! It sure is Denise! So grateful for His power to heal. Thank you Sheila. May you also, as you stay in the embrace of He who loves you best. One of my favorite Psalms. Thank you! It’s a good one, isn’t it? Thanks for dropping by, Richard. What a beautiful post , packed full of His Word and assurances for us! Thank you for helping me praise Him tonight, for He is so worthy!! God bless you and yours! Thank you Debbie! May you find joy and gladness in praising His beautiful name throughout today. Reblogged this on iLife Journey. I’ve been hearing/reading this topic often. It is something I need to work on, too. How easily murmuring and complaining thoughts come–but I will take them captive and turn them into blessing, with His help. It is so easy to only see the negative and forget all that God has done. Praying we would remember, and reflect on who He is and what He can do for us.